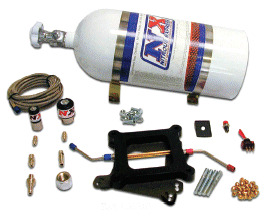 The "Hitman" is Nitrous Express' latest product in the "Next Generation Nitrous System" line. Equipped with the latest Pure-Flo Bottle Valve, stainless steel bottle brackets and the adjustability of three horsepower settings (100, 150, 200) the "Hitman" is the perfect lowcost introductory system for the nitrous novice. Available for Holley 4150, 4500, Spreadbores and Q-Jet Carburetors.